This version of the well-known Snake game is very interesting. It features seven mazes, bonus items, one-way streets, multiple difficulty levels, highscore tables, user-friendly menus and joystick support. 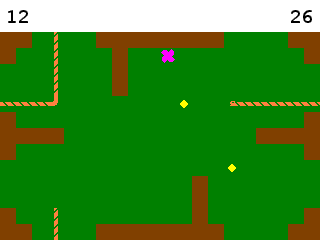 Of course you can also play without maze and there's a maze editor to create custom mazes with. Music and sound effects are included, but can be turned off via the options menu. Additionally, the game even contains an option to play in black and white. Nobody has shared their opinion about Blijbol Snake 2 yet. Be the first. Recommendations: The 1 people who like Blijbol Snake 2 also like the following games. Nobody has commented on Blijbol Snake 2 yet. Be the first.